Outside the Splendid Hotel in Ouagadougou, Burkina Faso, on Saturday, after gunmen launched attacks on two hotels and a cafe. OUAGADOUGOU — The Al-Qaida fighters who stormed a popular hangout in Burkina Faso’s capital at dinnertime [on Saturday, Jan 16] came with a mission to kill as many people as possible, firing at people as they moved to a nearby hotel and setting the cafe ablaze, survivors and officials said Saturday. When the gunfire stopped after a more than 12-hour siege, at least 28 people had been slain in an unprecedented attack on this West African country long spared the jihadist violence experienced by its neighbors. Like the extremist attacks from Paris to Jakarta, the assailants in the Friday evening attack targeted an area where people from different nationalities gathered to enjoy life. Here in Ouagadougou, the victims had been grabbing a cold drink outside or staying at one of the capital’s few upscale hotels. 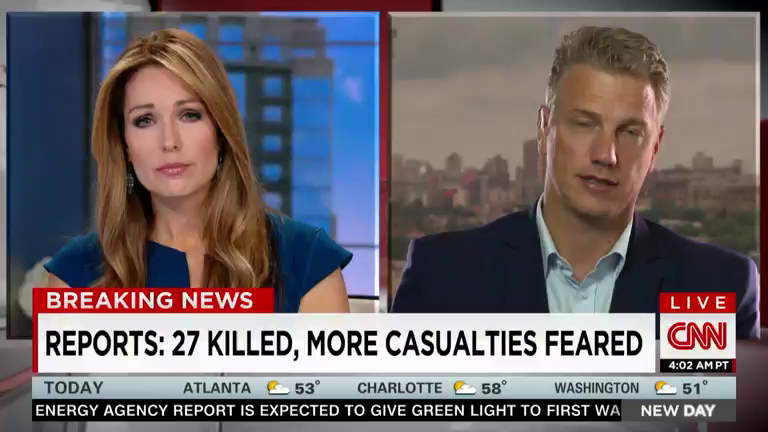 In this city with a large aid worker presence, the attackers sought to shoot as many non-Muslims as possible, screaming Allahu akhbar (Arabic for “Allah is great”) as they entered. Among the victims from 18 different countries were the wife and 5-year-old daughter of the Italian man who owns the Cappuccino Cafe, where at least 10 people died in a hail of gunfire and smoke after the attackers set the building ablaze before moving on to the Splendid Hotel nearby. Some survivors cowered for hours on the roof or hid in the restaurant’s bathroom to stay alive. Two French and two Swiss citizens were confirmed among the dead late Saturday by the two countries’ foreign ministries. The mother-in-law of an American missionary confirmed Saturday that he was among the dead. Carol Boyle said Michael Riddering, 45, of Cooper City, Florida, had been working in Burkina Faso since 2011. Riddering died in the Cappuccino Cafe, where he was to meet a group planning to volunteer at the orphanage and women’s crisis center he ran with his wife Amy. Canadian Prime Minister Justin Trudeau said in a statement Saturday that six of the dead were Canadians. Authorities said the four known attackers — all killed by security forces — had come in a vehicle with plates from neighboring Niger. At least two of them were women and one was of African descent. Witnesses said they wore the turbans often worn in the sand-swept countryside of the Sahel, and some spoke in French with an Arabic accent, suggesting some may have come from further north in Africa. Burkinabe forces backed by French soldiers based in neighboring Mali managed to help free at least 126 hostages though officials have said the true number of those held hostage may be higher. Dozens were wounded in the overnight siege, including many suffering gunshot wounds. “We appeal to the people to be vigilant and brave because we must fight on,” President Roch Marc Christian Kabore said on national radio Saturday. The North Africa branch of al-Qaida, founded in Algeria, claimed responsibility for the bloodbath even as it was unfolding in a series of statements published and translated by the SITE Intelligence Group. The al-Qaida affiliate known as AQIM — now working in tandem with feared extremist Moktar Belmoktar — later released an audio clip it said was a conversation with one of the fighters later slain in Ouagadougou. 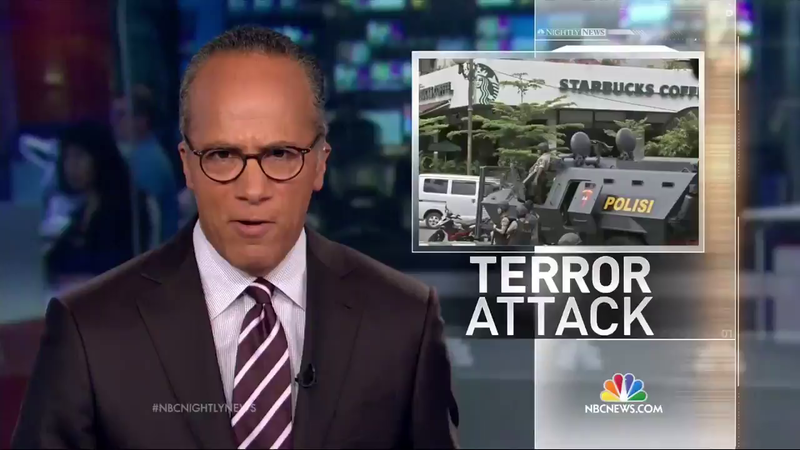 JAKARTA — Thursday’s bomb and gun attack on Westerners at a Starbucks in the heart of Indonesia’s capital was funded by ISIS, police said Friday after arresting three men on suspicion of links to the plot, seizing a militant flag from the home of one suspect. National police chief Gen. Badrodin Haiti told reporters that Thursday’s four-hour attack was funded by ISIS through Bahrun Naim, an Indonesian who spent one year in jail for illegal possession of weapons in 2011 and is now in Syria fighting for the self-declared caliphate. The ISIS link poses a grave challenge to security force in Indonesia, which until now was thought to have relatively few sympathizers and no active cells capable of planning and carrying out such an attack. 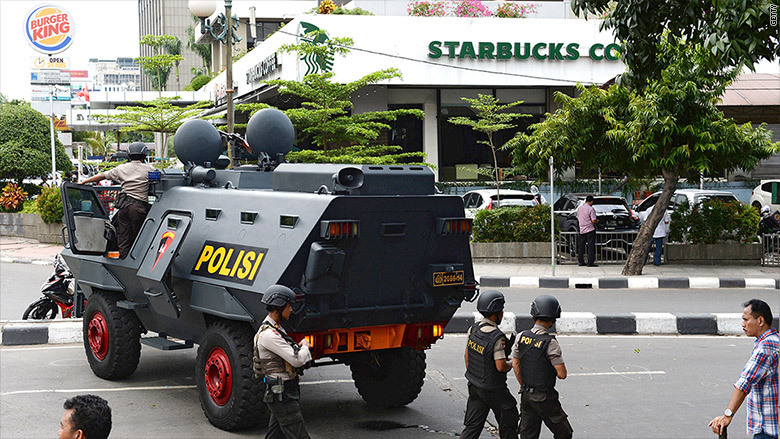 Two civilians – a Canadian and an Indonesian – were killed in Thursday’s assault, in which five men attacked a Starbucks cafe and a traffic police booth with hand-made bombs, guns and suicide belts. The attackers were killed, either by suicide vests or subsequently by police. The attack “was funded by ISIS in Syria through Bahrun Naim,” Gen. Badrodin Haiti told reporters after Friday (Muslim) prayers, without elaborating. He also identified one of the five attackers as Sunakim, who was once sentenced to seven years in jail for his involvement in military-style terrorist training in Aceh, but was released early. Earlier Friday, police arrested three men at dawn in their homes in Depok on the outskirts of Jakarta, and more raids were being conducted in Java, Kalimantan and Sulawesi provinces based on evidence found at the scene, national police spokesman Maj. Gen. Anton Charliyan said. It was the first major attack in Jakarta since the 2009 simultaneous terrorist attacks on the J.W. Marriott and Ritz Carlton hotels, which [were carried out by extremists from another Muslim terrorist group and] left seven people dead. Since then, the secular government has made major inroads beating back terror groups in an Asian nation where about 87% of its roughly 255 million people are Muslim. Experts agree that there is a growing threat from radicalized Muslims inspired by Islamic State, some of whom may have fought along with the group in Syria. They said the [thankfully] low death toll on Thursday pointed to the involvement of poorly trained local terrorists whose weapons were crude. 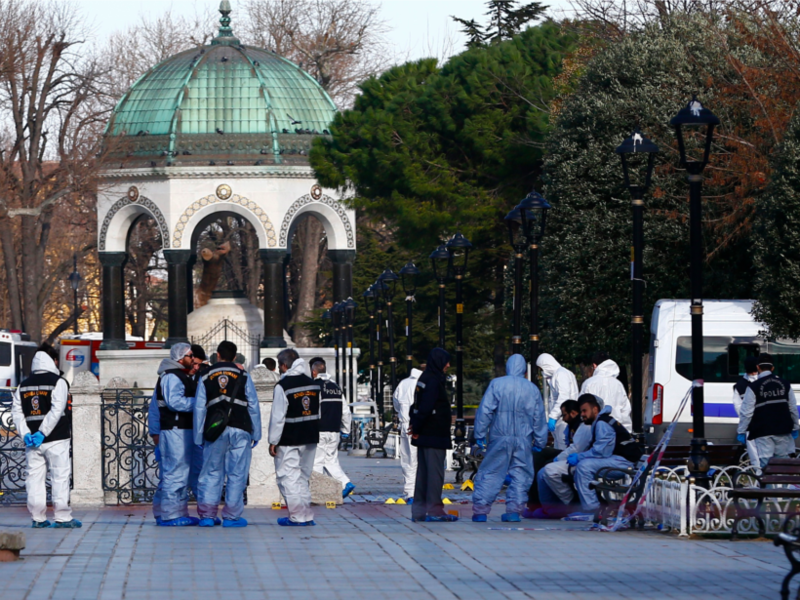 ISTANBUL – A suicide bomber thought to have crossed recently from Syria killed at least 10 people, most of them German tourists, in Istanbul’s historic heart last Tuesday, in an attack Prime Minister Ahmet Davutoglu blamed on Islamic State. All of those killed in Sultanahmet square, near the Blue Mosque and Hagia Sophia – major tourist sites in the center of one of the world’s most visited cities – were foreigners, Davutoglu said. A senior Turkish official said nine were German, while Peru’s foreign ministry said a Peruvian man also died. 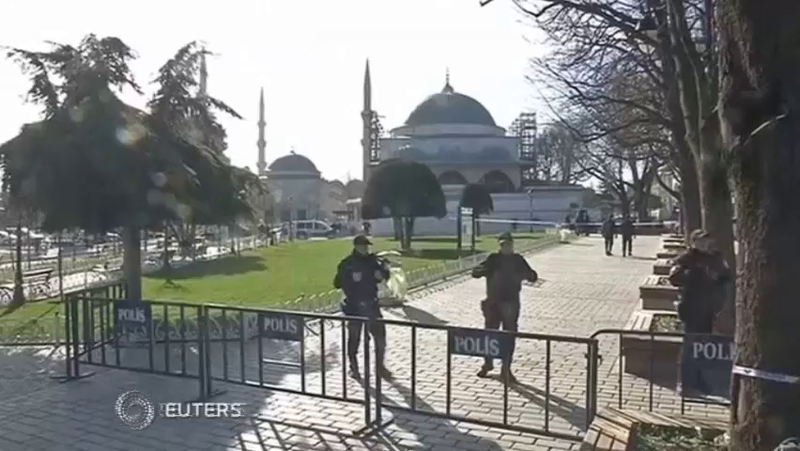 ISIS terrorists targeted tourists in Istanbul, Turkey. Deputy Prime Minister Numan Kurtulmus said the bomber was believed to have recently entered Turkey from Syria but was not on Turkey’s watch list of suspected militants. He said earlier that the bomber had been identified and was thought to be a Syrian born in 1988. Davutoglu said he had spoken by phone with German Chancellor Angela Merkel to offer condolences and vowed Turkey’s fight against Islamic State, at home and as part of the U.S.-led coalition, would continue. 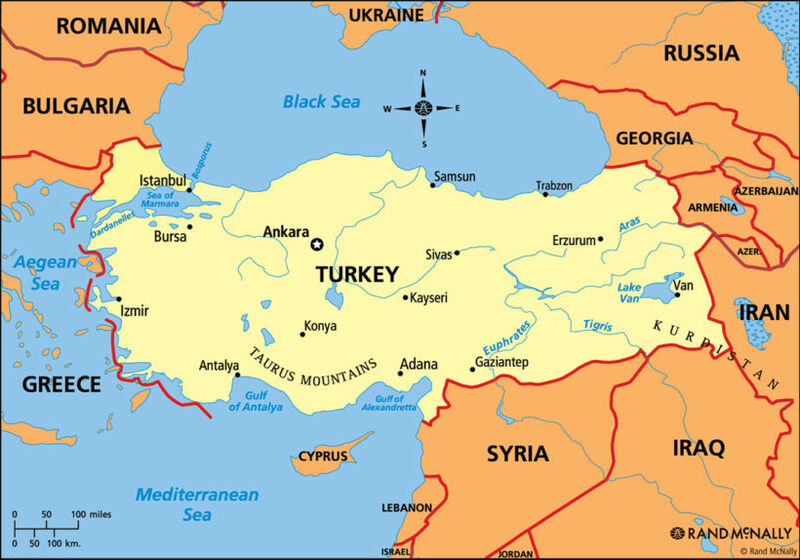 Turkey, a candidate for accession to the European Union, is part of the U.S.-led coalition against Islamic State fighters who have seized territory in neighboring Syria and Iraq, some of it directly abutting Turkey. Davutoglu’s office imposed a broadcasting ban on the blast, invoking a law which allows for such steps when there is the potential for serious harm to national security or public order. Turkey has faced criticism at home and abroad for failing to do more to fight Islamic State networks, but Interior Minister Efkan Ala defended Turkey’s record, saying 200 suspects had been detained just a week before the Istanbul blast. b) What did the attackers scream as they entered the hotel? c) What was their mission? d) What was their motive? e) What is significant about this Islamist terrorist attack in Ouagadougou? b) Who did ISIS say they were targeting in their attack? c) What major concern do police and security forces have in Indonesia after this attack? b) How did the Syrian suicide bomber get into Turkey? c) How did Turkish Prime Minister Ahmet Davutoglu react to the attack? What is similar about the terrorist attacks in Burkina Faso, Indonesia, Turkey and last month’s Paris attack? The population of the world is 7.1 billion. In 2015, James Clapper, U.S. National Intelligence Director, estimate that ISIS had somewhere in the range between 20,000 and 32,000 fighters. -How do you think world leaders should respond to the threat of ISIS? -What do you think the U.S. should do to completely wipe out ISIS? -Which U.S. presidential candidate do you think would be most effective at destroying this threat? Burkina Faso is a largely Muslim country though it is home to a number of French nationals as a former colony of France. Islamic extremists in the region have long targeted French interests, incensed by France’s military footprint on the continent more than a half century after independence. France led the military effort in 2013 to assist the country in ousting Islamic extremists from their seats of power in northern Mali, and continue to carry out counterterrorism activities across the Sahel region. 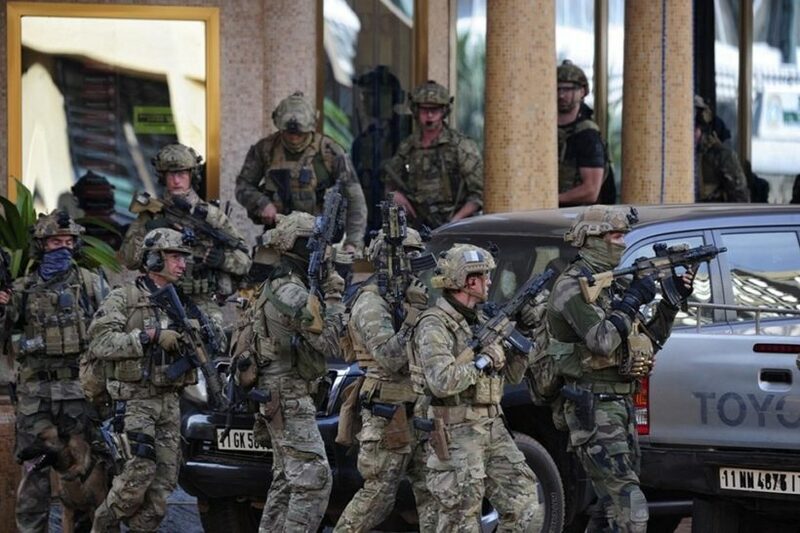 French special forces were also front and center early Saturday, as police and military forces fought to take back the Splendid Hotel. After freeing the hostages there, forces then scoured other buildings including the Hotel Yibi where they killed the fourth attacker, the president later said. 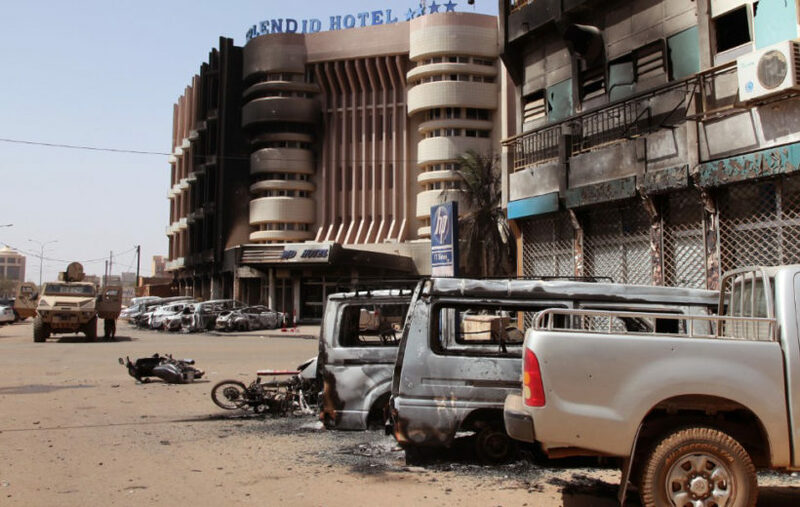 The horror closely mirrored the terrorist siege of an upscale hotel in Bamako, Mali in November that killed 20 people and shattered the sense of security in the capital of a nation whose countryside has long been scarred by Islamic extremism. Burkina Faso was better known for the role its president and officials played in mediating hostage releases when jihadists would seize foreigners for ransom in places like Niger or Mali. Now though, it appears Burkina, too, has been turned into a place where Westerners are at high risk. 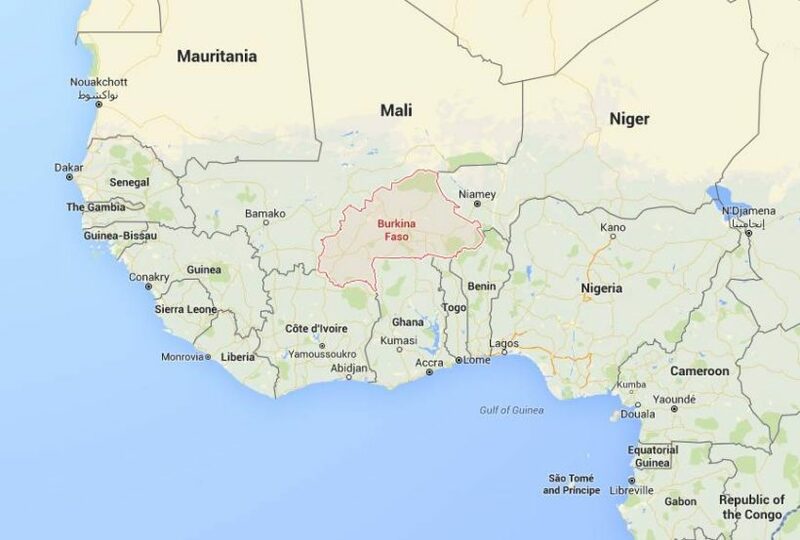 On Sunday, Australia’s Department of Foreign Affairs and Trade said in a statement that an Australian doctor and his wife had been kidnapped in Burkina Faso’s north. The two were abducted from the town of Djibo near the border with Mali. Australian media reported the couple are surgeon Ken Eliot and his wife Jocelyn. The couple are in their 80s and are originally from the Australian city of Perth. The reports said the couple have lived since 1972 in Djibo, near Baraboule, where they work in a volunteer medical clinic which they built. ISIS claimed responsibility for the attack in an official statement posted online by the terror organization. The Islamic State suicide bomber who killed 10 German tourists in the heart of Istanbul’s historic district entered Turkey as a refugee from Syria and went undetected as he was not on any watch lists, Prime Minister Ahmet Davutoglu said on Wednesday.